The Leasehold for The Chalet Chevron Bed & Breakfast Hotel is for sale. This property with its gloriously funky rooms is located on high profile Brighton Road just a short walk to the vibrant shops and restaurants of Parnell Road. Here, history, character and charm have melded to become a truly iconic small hotel punching above its weigh in guest satisfaction. With 13 character guest rooms, most with sunny outlooks and some with superb views to the harbour, this has become a firm favourite with discerning tourists over its many years of operation. Every guest room has its own en-suite, a major plus and now expected by savvy travellers. Originally built as a substantial family home in 1929 in the style of an English Cottage, the Chalet Chevron was later extended and converted to accept ‘paying guests’ in its quaint and uniquely styled bedrooms. 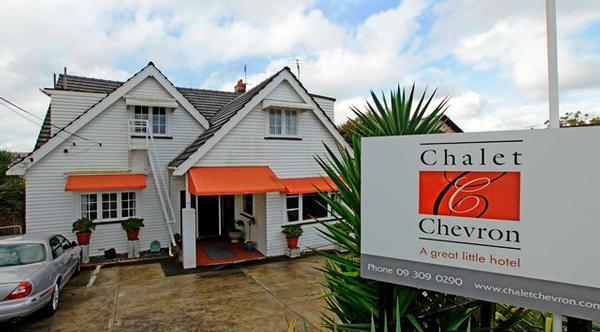 Chalet Chevron is located on the slopes of Parnell, established as the first suburb in New Zealand in 1841 and fittingly, she is one of New Zealand’s oldest, well kept, private bed and breakfast hotels situated in the first and surely most vibrant of neighbourhoods.